Bhogar, using the nine different minerals, creates the Dandapāni vigraha and sanctifies it. 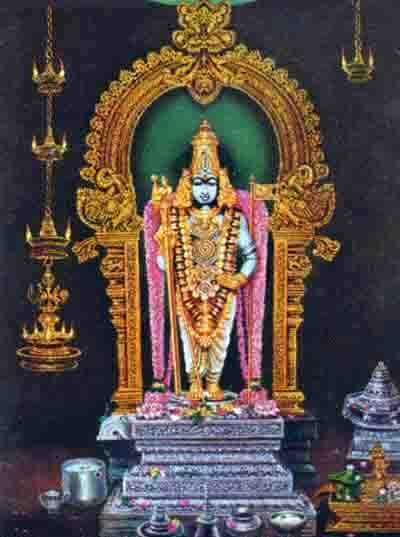 Lord Murugan is the deity of the Tamil Land. Palani (Tiru Avinankudi) is the third Padai Veedu. 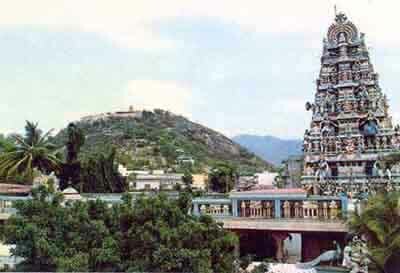 The temple at Palani is an ancient one, situated at an elevation of 1500 feet above sea level. The deity of Palani is known as Dandayudhapani Swami, the Lord having the Staff in his Hand. The deity at the sanctum sanctorum is made out of an amalgam of nine minerals popularly called Navabashana. The deity is in a standing position with a baton in his hand. He has the look of a person who has renounced all worldly pomp. He has just a loincloth besides the baton. He is a mute messenger of the great precept 'Renounce all to reach Me'. The icon is unique in the whole world. It was made by siddha Bhogar by combining nine poisonous substances (navabashana). 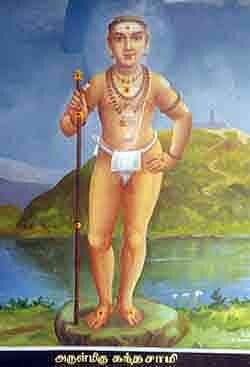 Murugan signifies beauty and Lord Murugan of Kurinji land is the god of Beauty and Youth. There is a legend how Lord Murugan came to this sacred spot. Narada Muni, a sage, brought a golden mango to the divine court of Lord Siva when Lord Siva was seated with his consort Parvati and His children Lord Vinayakar and Lord Subrahmanya. Narada gave the fruit to Lord Siva and implored Him to eat since it was a rare, miraculous Jñanapalam, the fruit of wisdom. As a loving husband, Lord Siva gave it to Parvati and requested her to eat. As a loving mother, she wanted to give the fruit to her children. As there was only one fruit and it should not be cut, they announced a contest and said that the winner would be given the fruit. Whoever completes one round of the globe first will be given the fruit. There are six pujas every day. At 5 am the Lord gives Visvarupa Darshana. The first puja is Vizhapuja at 7:15 am followed by Kala sandhi at 8am, Uchikalam at 12 noon, Sayaraksha at 6 pm and Rakkalam at 8 pm. 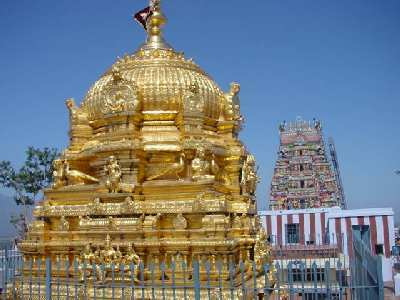 The Golden Chariot goes round the praharam on the top of the hill in a ceremonious procession along with nadaswaram, Tiruppukazh music and other temple paraphenalia at 7 pm on all Karttikai days and as per the request of the devotees. The illuminated Golden Car is a veritable fairyland. Panguniuttiram, Thai Pucam, Kanda Sasthi, Agni Nakshatram are the major festivals. Vaikasi Vishakam, Tirukkarttikai and other festivals are also celebrated.  Devotees from various places bring different types of kavadis and offerings to the Lord by pada yatra or foot pilgrimage, the most popular time being Thai Pucam. The Bhogar Shrine is in the southwestern corridor of the hill temple. 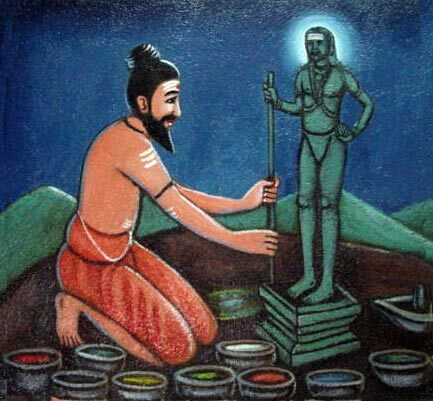 Siddhar Bhogar created the icon (the amalgam of nine minerals) and did daily services. He lived long ago, perhaps 3000 BC. A medical prodigy as he was, he could prepare the amalgam on nine medicinal minerals in proper proportion. In this shrine, pujas are offered to Navadurga, Bhuvaneswari and Maragatha Lingam that were worshipped by Bhogar. It is said that there is a subterranean tunnel linking the shrine with the sanctum sanctorum through which Bhogar is said to go to the main idol and perform daily pujas as he is said to be only in nirvikalpa samadhi. 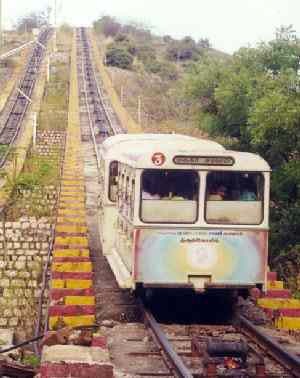 To climb the hill, there are also winch trolleys in addition to the traditional route of 697 steps. Giving annadanam at the hill temple at 12:30 pm is a useful scheme for the benefit of the devotees. If a donor deposits Rs 25,000, the interest of it will be utilised for annadanam on a particular day as per the request of the donor. 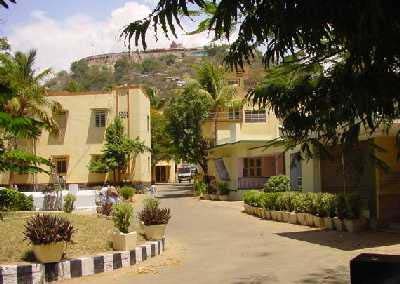 Devasthanam pilgrim accommodation: "Dandayudhapani Nilaiyam"
The Devasthanam has constructed pilgrims' resthouses, single, double, deluxe and air-conditioned rooms as well as cottages. Reasonable rates are collected from the devotees. Palani is reached by just three hours drive from any of the nearest airports: Coimbatore, Madurai and Tiruchy. It is an important railway station on the Dindugal-Coimbatore line. The nearest tourist information office is at Madurai. 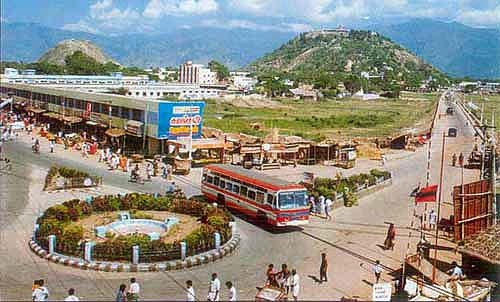 There is a Palani Devasthanam Information Centre at the Palani bus stand.